The unless is the logical opposite to if. Statements can completely bypass the success status and only be executed if the expression returns false. the unless statement is best used when you want to raise an error only if the expression fails. Die function works like warn, except that is also calls exit, within a normal script, this function has the effect of immediately terminating execution. Cluck function is a sort of supercharged carp, it follows the same basic principle but also prints a stack trace of all the modules that led to the function being called, including the information on the original script. Croak function is the equivalent of die. it reports the caller one level up. Like die, this function also exists the script after reporting the error to STDERR. The tie() function binds a variable to a class (package) that will provide the implementation for access methods for that variable. Once this magic has been performed, accessing a tied variable automatically triggers method calls in the proper class. The complexity of the class is hidden behind magic methods calls. 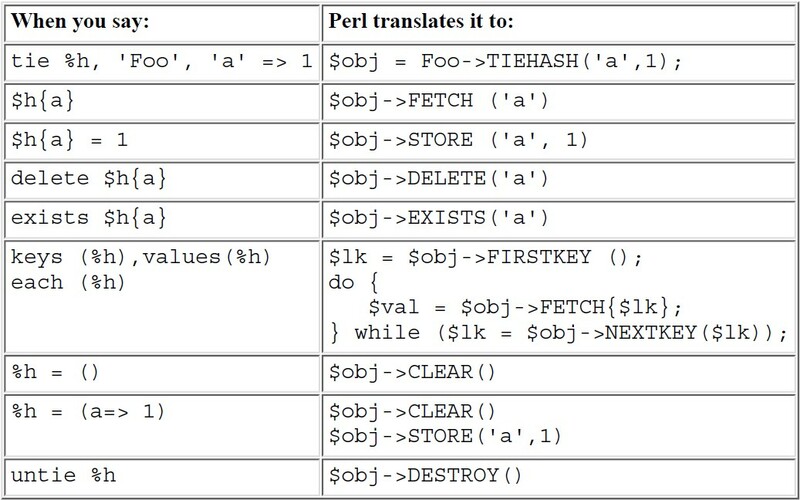 The method names are in ALL CAPS, which is a convention that Perl uses to indicate that they’re called implicitly rather than explicitly–just like the BEGIN() and END() functions.